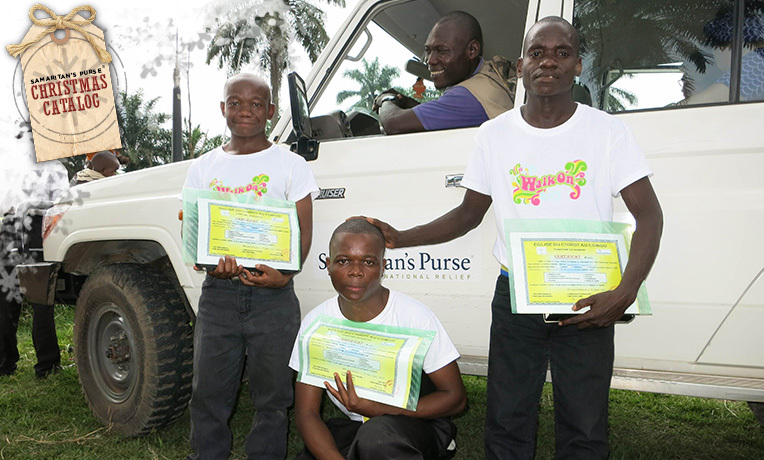 Samaite, on left, is one of 31 students who recently graduated from Samaritan's Purse Bible school in the Democratic Republic of the Congo. Written by Pastor Obed Mukanirwa, the ministry coordinator for Samaritan’s Purse in the Democratic Republic of the Congo, and Elise Cegielski, a communications intern. 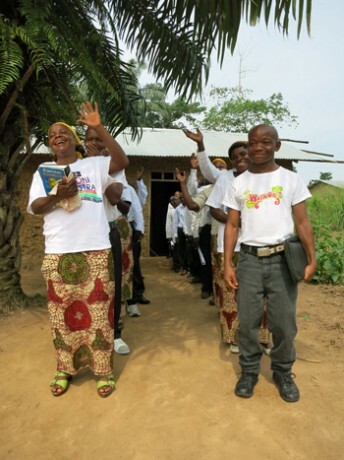 Christianity has had a long presence in Congo, but it has failed to mature in many remote areas of the country. Plagued by war, syncretism, lack of leadership, corruption, and isolation, the local church is struggling to survive and often is ineffective as salt and light in a country desperate for truth and peace. The northeastern part of the country is trapped in a cycle of violence and all the effects that follow: insecurity, displacement, poverty, malnutrition, and disease—and the church is not immune. During the past two years, the Samaritan’s Purse ministry team has come across many churches without pastors; some have been killed, while others have not returned since fleeing rebel violence. The pastors and leaders that remain have minimal training from Bible schools or missionaries and no access to teachings combating animism, further contributing to the persistence of a deep spiritual darkness. As with much of rural Africa, traditional animism and ancestor-worship are real opponents to the light of Christ. Often the same people that attend local churches and worship God by day are also involved in traditional rituals by night. The worldview that appeasement of intermediary spirits is necessary for a successful life controls the minds and hearts of many people in northeastern Congo. And the strong grip of fear in which people find themselves is crippling when the church doesn’t take a stand with the message of freedom and peace in Jesus. To bring light to spiritually dark places, the ministry team piloted a new approach for strengthening rural churches using portable Bible schools last year. The first program hosted 24 church leaders who had never attended Bible school. We gave them a three-month practical training on Old and New Testament, core doctrines, evangelism, discipleship, preaching, and discerning cults. Samaritan’s Purse partnered with professors from several Christian universities to come and teach. Samaite (right) has been able to share the Good News with 26 people in his community, and he’s continuing to witness to others with the training he received from Samaritan’s Purse. Since then, we’ve run several more portable Bible schools in areas of need, and the response is incredible. The number of students has exceeded our expectations and people are journeying huge distances just to participate. Recently, we completed a Bible school in the area of Mambasa. Thirty-one students graduated from the program. Three were pygmies from Akokora, which is nearly 30 miles away. They were so interested that they were willing to travel that distance to receive training. After the course, they returned home and started sharing the Gospel with other pygmies, both nomadic and settled. Within a month, one of our students, Samaite, was able to reach 26 people and bring them to Jesus. It’s amazing to see how God has used this man to bring revival to his community. We don’t want to merely deliver physical aid to an area without giving people a greater hope and a means for it to continue growing after we’re gone. The Bible school is doing just that: building up local leaders to serve their communities and share the love of Christ for years to come. Train and Equip an Evangelist Many church leaders have a heart for sharing the Gospel but have never learned how to preach it with power and truth. Others need training to combat cults or spiritual warfare. For a gift of $35, we can offer advanced Bible classes for local pastors or supply evangelists with audio or video equipment so they can be lights in the darkness.